A late running train scuppers my chances of catching Sasha Siem but at least the weather in Brighton is considerably better than day one of the festival. Glaswegian C Duncan became my first port of call, where he kicked off proceedings at the Brighthelm Centre. Coming across somewhere between Grandaddy and Beach Boys, it was a promising start to the day. After spending much of the first day at Green Door Store, with mixed results, I took a chance on Gabrielle Papillon and her band. Papillon's soothing voice and sweet naivete belied the darkness of much of her material. The Basement was next on the list of venues, where I expected to arrive just in time for Radio On at an Alternative Escape show, hosted by fellow blog Killing Moon and friends. Except nothing much was going on, thanks to a noise complaint that brought things to a not-so-screeching halt. A boatload of records from the hosts was suitable recompense and we eventually got to enjoy the band's synth-infused indie. Understandably things are quieter than usual. But more to the point, Radio On were quietly impressive. A clash conundrum followed but I opted for Belfast quartet Loris at one of The Great Escape's oddest venues, the Spiegeltent - a cabaret-meets-circus setting. Their electro-pop bubbled away nicely but probably was better suited to a nighttime boogie. With no hope of getting into the much hyped Aurora set just a few feet away, I gave The Basement another go for electronic project Chimes. Visibly struggling with the levels, the duo felt like they were hitting their stride just as I had to leave. The Shipwright's Yard was the next pit stop, although late running meant that it was the lounge pop of Brighton's own Chungking that I initially witnessed rather than the expected moody folk sounds of Jagaara - one of our tips for the festival. They followed not too long after, and the trio of sisters demonstrated why they're being in the held in similar regard to fellow sibling outfits HAIM and The Staves. Late running had threatened to become a recurring theme of the day but having caught up with an ex and made it all the way down Brighton Pier to Horatio's Bar before Avec Sans were due on, I discovered them in full flow. A striking set was unfortunately scuppered by a total technological breakdown, although the electro duo handled this suitably well, even engaging the audience in an acapella singalong. That turned out to unexpectedly be my last live outing of the day as Aurora at Coalition and Bully at The Haunt both presented gargantuan queues - a definite sign that the 2015 edition of The Great Escape was one of the most popular. And with both bands receiving glowing reviews, I certainly hope to see them back at the festival in future. 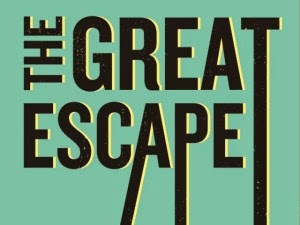 Find more info about The Great Escape at greatescapefestival.com.